Although my mother is still with us physically, so much of her is gone. I feel that only her spirit and the Holy Spirit, who lives in her, remains. This tells me that her time to meet our Lord and Savior is coming soon. Some of you are wondering how she got to the condition that she is currently in. So first, I want to spend some time telling the story of how we figured out she had this very rare, aggressive, terminal form of dementia. I believe it started around July 2014. Up until then, my mom and I talked pretty much daily on the phone. She would tell me all about her day and what everyone else that I knew there in Oklahoma was up to, and I would tell her about my day and what we were up to. If I got really busy and wasn't able to call one day, she would call me the following day out of concern. In July, I began noticing that she didn't call me any longer. If I wanted to speak to her, I had to call her. This was very odd to me. Then, she began to have "falls." This was extremely out of the ordinary for her. In August she started having memory problems. It was also during that month that she went on vacation with my sister and her family. On that vacation, my mom had a pretty bad fall. We all began to notice around July that she barely ate anything. My sister and I would discuss my mom's condition frequently, and we made a pact to check up on her regularly to make sure she was eating. My conversations on the phone with my mom began getting very short, and I noticed I was pretty much the only one speaking. I began to wonder if my mom was upset with me for some reason. Although, she had never been upset with me like that before and I couldn't think of anything I did that would have upset her. It just didn't make sense to me. As my sister and I continued to discuss her condition while the months passed, we began to think maybe she was beginning to get depressed. My parents were discussing selling their business, which they have owned about 25 years. It was time for my mom to finally retire. My mom worked there 5 days a week, for about 12 hours per day. It was a big part of her life. So, it made sense to us that she could perhaps be depressed, since she could possibly be losing that part of her life soon. We also later discovered that she had not taken her thyroid medication in over a year. She had a portion of her thyroid removed about 30 years before, and she was supposed to be on thyroid medication for the rest of her life. So, there were multiple factors working and we were thinking her condition could be related to any of those. Then, my parents came to visit me for Luke's birthday in early October 2014. 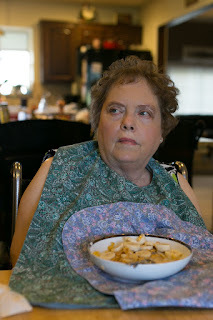 I noticed my mom was beginning to eat more, but she just wasn't herself. Her hands trembled pretty significantly. I saw she had been eating, so I knew it wasn't due to hunger. I also noticed she didn't talk as much. She just wasn't my mom. We visited my parents over the Halloween weekend later that month, and I was extremely concerned. She said she had seen a couple of doctors and they said that they couldn't find anything wrong with her. However, she told me a story about how she left their house to go to a grandparent's day event at my niece's school (which was about 25 minutes away) at 4am. The event started at 9am. I asked her why she left so early. She told me that she was concerned about traffic. That's when I added "irrational thinking" to the list of symptoms. By the end of the weekend, I was extremely concerned. My sister and I, along with my dad, decided to accompany her to the doctor that Sunday. We ended up having to go to the Emergency Room, but I was determined to get her condition figured out before I left the following day. Unfortunately, the ER physicians were not helpful. After we gave the the enormous list of symptoms, they ran a couple of tests and said everything was normal. They wouldn't even do an MRI of the brain. We were very disappointed. Following that ER visit, my sister and brother-in-law arranged some meetings with an excellent psychologist, as well as a neurologist. My mom was able to get into see the psychologist fairly soon, but had to wait several months before she could see the neurologist and undergo rigorous testing. She also had an MRI and an EEG done per the neurologists request. 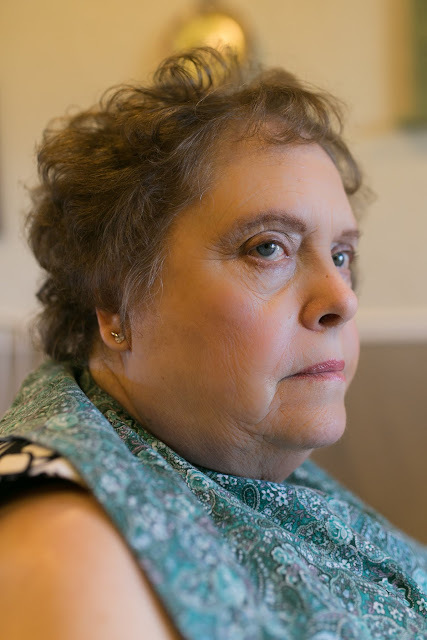 When the results of all of this testing came in, the neurologist told us he was pretty certain she had CJD. My brother, Jeremy, had actually brought CJD up in November or December, because her symptoms were so similar. Yet, we all figured, surely she doesn't have that extremely rare disease. Also, we had read that the only true way to diagnose it is via autopsy. So, we weren't going to just assume that the diagnosis by the neurologist was accurate. Thus, my mom got a second opinion with a geriatric physician. By this point, my mom was so tired of the doctor appointments, testing and multiple physicians. But, we wanted to be certain that there wasn't a possibility of her having a different diagnosis. She also saw an endocrinologist in this time period to rule out thyroid issues. The geriatric physician believed she had vascular dementia. In the meantime, Jeremy contacted the University of San Francisco, which has a special research program on CJD. They were very interested in reviewing my mom's records. So, my siblings gathered them together and sent them to the research center. They, unfortunately, confirmed the diagnosis of CJD based on what they saw. But, they were willing to thoroughly test my mom to make sure. In addition, they would provide a lot of helpful information on the rare disease, since they are experts. They offered to do all the testing free of charge, my parents just had to pay for the flights, lodging and food. Booking travel last minute can be costly, but family and friends raised enough money within the two weeks to send them to San Francisco. There, they confirmed the diagnosis (although still, the only true confirmation is autopsy) and provided us with helpful information. That was June of this year. She was beginning to have more difficulty walking. I was there just a few weeks ago in August, and then I was also just there this past Labor weekend. Unfortunately, the disease has significantly progressed in just those few weeks. She doesn't really talk at all. She can no longer walk. She is incontinent. She trembles. She has no muscle tone at all. She can't feed herself. 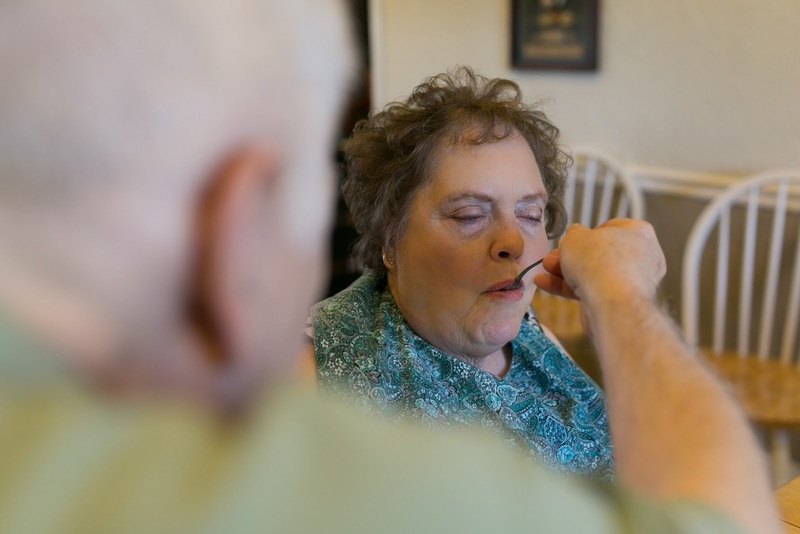 She has trouble swallowing and, at times, breathing. They began giving her oxygen yesterday. Yet, her sweet, sweet spirit remains. She doesn't talk at all, yet we brought her to church on Sunday, and I looked over down the pew and noticed her mouthing every single word to the worship songs and hymns we were singing. The Holy Spirit is definitely alive in her. This, of course, gives me hope. a photo I took as my dad fed her this weekend. I did her hair and makeup and we attended church after breakfast. If you want to read more about this disease, click here. I certainly wished she were diagnosed earlier, as that would have given me more time with "her." There are so many questions I have that I wished I had asked her when she could speak. This saddens me. "My mom has the best memory of anyone I know. She can tell me what I was wearing 20 years ago on our family vacation. OK--maybe a bit of an exaggeration, but her memory is crazy sharp! So, with a memory like that, she can recount specific challenges she had with us [as a young mom] and how she dealt with them. My mom also didn't have it very easy. I was born, then 11 months later my identical twin brothers were born, then 2.5 years later my sis was born. And, the closest family members were about 5 hours away. They had no help in raising us. My dad worked very hard. When we were young, he probably averaged 60-70 hours of work per week. So, this sounds pretty difficult right? Four kids, ages three and under, and no family in town to help out or provide "relief" when needed. Then how in the world did she make it look so easy??? I can tell you that I NEVER recall my mom raising her voice. We ALWAYS ate an excellent home-cooked meal with all four food groups on our plates. We VERY RARELY ate out (maybe once a month on a Sunday after church). She chauffeured us from activity to activity. I also remember my siblings and I laying on the floor (I must have been 4 or 5 years old) all in a row while my mom rubbed our bellies before nap or bedtime. Then, she would carry us one by one to our beds. We all felt loved. She is my inspiration. When I am having a tough day, I just think about my mom and how she had it so tough, but made it look so easy. She never appeared stress. I think this is so important in raising our children. So, instead of relying solely on the internet for parenting advice, I go to my mom. I combine her advice with some Biblical wisdom and hopefully I have a good recipe for raising these special blessings God has given us." 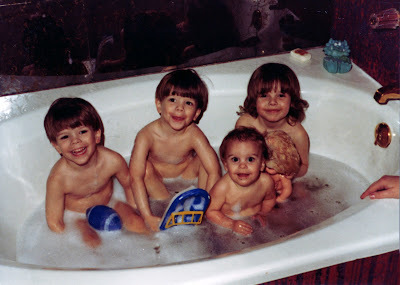 I am sure bath time was interesting with 4 littles. peacemaker--I never heard her argue or have to "be right." Excellent listener--never interrupts, lets you just talk--I so miss our daily conversations. She has a servant's heart. She has served, served, served her whole life. When she was home, she rarely sat down and was cooking, cleaning, etc. She took care of everything and everyone. She worked so hard--at their business, she worked so hard to please every customer, even if it meant working 12 hours per day M-F, which she did consistently. She has such a sweet spirit. Patient--obviously--she had to have some patience to be able to deal with all of us kids! Excellent cook. She didn't use cookbooks--it was just all in her head. She is so giving--of her time, talents, and energy.